2 Cannabis Control Act violations, etc. Fig. 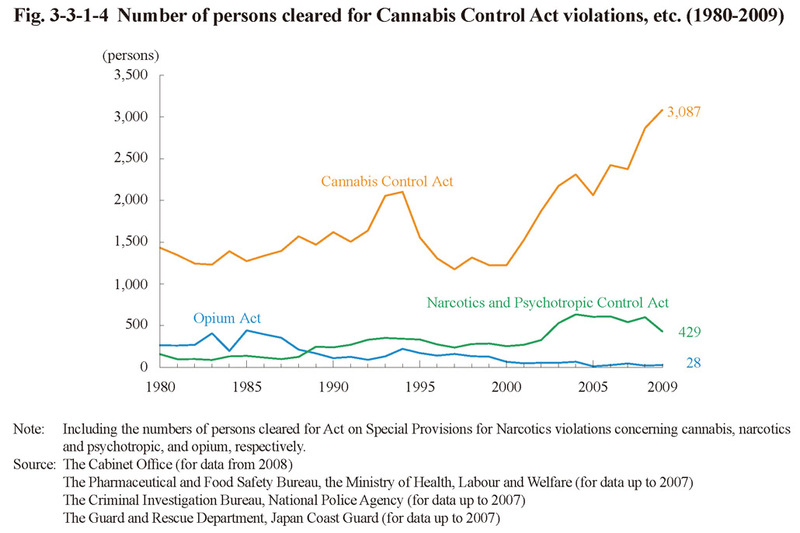 3-3-1-4 shows the number of persons cleared for Cannabis Control Act (Act No. 124 of 1948) violations (including Act on Special Provisions for Narcotics violations concerning cannabis; hereinafter the same in this subsection), Narcotics and Psychotropic Control Act violations (including Act on Special Provisions for Narcotics violations concerning narcotics and psychotropic; hereinafter the same in this subsection), and Opium Act (Act No. 71 of 1954) violations (including Act on Special Provisions for Narcotics violations concerning opium; hereinafter the same in this subsection) over the last 30 years. 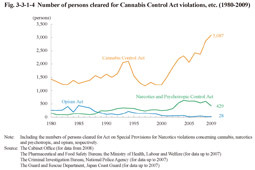 The number of persons cleared for Cannabis Control Act violations has been on a significant increasing trend since 2001, reaching 3,087 in 2009, which is approximately 2.5 times that in 2000. The number of persons cleared for Narcotics and Psychotropic Control Act violations has also been on an increasing trend since 2001 but in 2009 decreased by 28.6% from the previous year to 429.